Nike Zoom Fly are neutral racing running shoes. The World famous Nike Zoom Fly is the racing flat which Nike has made finally available to general public (besides popular Air Zoom Pegasus 34) from its hyped Breaking2 project although hight price tag might not be affordable for every runner. Actually professional runners in Breaking2 wore a custom edition (codename Vaporfly Elite) from limited edition Nike Zoom Vaporfly 4% where the 4% stands for the improvement in energetic efficiency compared to other racing flats as backed in some scientific papers. 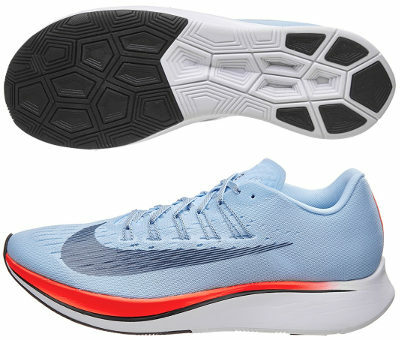 There is no doubt about the Zoom Fly being away from typical racing flat because of impressive stack height from Lunarlon midsole (disruptive ZoomX foam is only available in Zoom Vaporfly 4% at exorbitant price, not sure if it is worth it) which includes a full-length, carbon-infused nylon plate (completely made of carbon in more expensive Zoom Vaporfly 4%) to promote a more responsive ride specially suitable for non-heel strikers. Outsole configuration is plenty of pentagonal shapes in different sizes to optimize performance depending on the area and softer rubber in the forefoot offering great grip but raising some concerns about durability. Maybe the most "conventional" part of the Zoom Fly is the upper featuring wonderful FlyMesh which partially hides Flywire cables that embrace midfoot and provide a secure and snug fit. Upper design is very clear with big (specially on the external side) Nike logo (Swoosh) while several holes strategically located allow great breathability. It would be interesting to see what last from big marketing hype behind Breaking2 and collect unbiased feedback from people who pay for their running shoes and choose Zoom Fly or Zoom VaporFly 4% instead of more traditional ones like Zoom Streak 6.